Welcome! My name is Skye and this is my website. 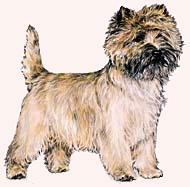 I am your typical everyday cairn terrier. 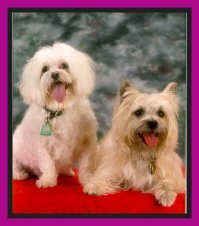 As you can see, I'm the cute shaggy one on the right. Next to me is Oban. Oban's story is found on the "All about Oban" page. Here at my site you will find Poetry, Photo's and Links to other great sites. On October 14,2006 at approximately 10:30am we said our goodbyes to Skye. last week at the vet clinic receiving fluids and antibiotics. Instead of improving she grew progressively worse. She wouldn't eat and her blood sugars were in the upper 400's. Growing weaker everyday there wasn't anything else we good do but let her go. She has crossed the Rainbow Bridge and is playing with Oban,George,TS and AK now. God Bless and be at Peace. On April 2, 2006 at approximately 11:30pm we said our goodbyes to Oban. Oban gave up the battle with Congestive Heart Failure. To say that he will be missed is an understatement. His loss is a physical one -it is as though a piece of our hearts have been ripped from our bodies. Skye is holding on and we are watching her carefully so that her mourning doesn't affect her health. On March 27, 2004 our sweet boy George crossed the Rainbow Bridge. His place in our hearts can never be filled. His loss is that great. On December 21, 2004 my family was dealt another blow.TS & AK both died. through an ultrasound it was discovered that she had two masses inside her. We felt it best to say our goodbyes all at once. Our hearts are broken and we miss there gentle purrs.